Syrian Kurdish forces declared victory over the Islamic State on Saturday, after a years-long fight to reclaim territory that once belonged to the terror group’s self-declared caliphate. At its peak in 2014, ISIS controlled approximately 34,000 square miles of territory across Iraq and Syria that was home to about 10 million people. On March 1, the Syrian Democratic Forces, SDF, began its last offensive to retake the city of Baghouz, the last ISIS stronghold along the Middle Euphrates River Valley near the Iraq border. Since that time, thousands of ISIS fighters and their families have poured out of the area with 62,000 mostly women and children arriving in poor health at the Al Hol camp, according to the International Rescue Committee (IRC). At least 100 people, mostly children, died on their way there during that time. The IRC described the camp as at a “breaking point” in terms of being able to house and care for the thousands of people arriving from ISIS-held areas. 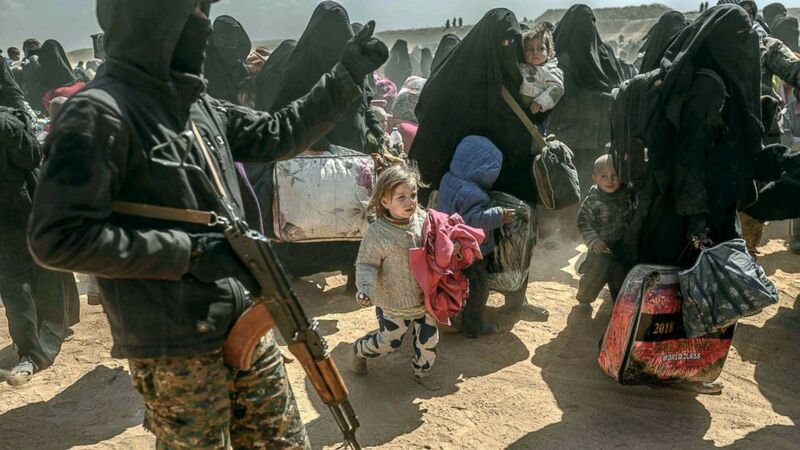 (Bulent Kilic/AFP/Getty Images) Women and children, evacuated from the Islamic State group’s embattled holdout of Baghouz, arrive at a screening area held by the US-backed Kurdish-led Syrian Democratic Forces in Deir Ezzor, Syria, March 6, 2019. Veiled women carrying babies and wounded men on crutches hobbled out of the jihadist village after US-backed forces pummeled the besieged enclave. Meanwhile, men who are determined to have allegiance to ISIS have been detained by the SDF. They now hold over 1,000 ISIS foreign fighters, along with thousands from Iraq and Syria. In its fight to retake land from ISIS in Syria, the SDF has received backing from the U.S.-led coalition comprised of over 75 nations and partner organizations. The first U.S. troops — just 50 advisers — arrived in Syria under the Obama administration in October 2015. That number has grown to about 3,000 as the U.S. prepares to withdraw most of those forces under orders by President Donald Trump. Trump had touted in recent days that ISIS was on its last legs. He proudly displayed a once-classified map showing how the forces had waned since his election two years ago on both Thursday and Friday. His declaration on Thursday that ISIS would be “gone by tonight” was the third time he’d declared victory in three months. About 400 U.S. troops will remain in two areas of Syria: in the northeast along the Turkish border to provide security and stability for Kurdish partners, and in the southeast at the At Tanf Garrison, a small U.S. base seen largely as a way to counter Iranian influence in the region. (Delil souleiman/AFP/Getty Images) Smoke and fire billow after shelling on the Islamic State group’s last holdout of Baghouz, in the eastern Syrian Deir Ezzor province, March 3, 2019. Kurdish-led forces backed by US warplanes rained artillery fire and air strikes on besieged and outgunned jihadists making a desperate last stand in a Syrian village. But even as the SDF declares victory, a long road lies ahead before cities and towns once held by ISIS return to any level of normalcy. 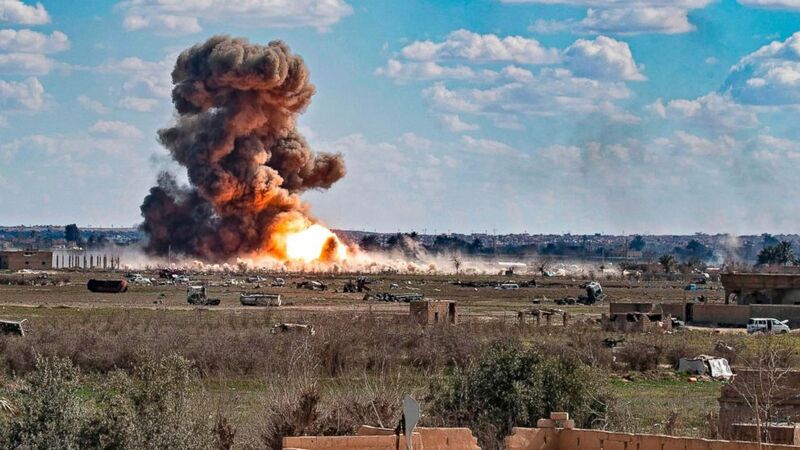 The SDF and coalition must conduct back clearance operations to rid areas of booby traps and improvised explosive devices (IEDs) left behind by the terror group. Additionally, it will cost billions to rebuild and restore communities extensively destroyed in the fight. Another challenge will be for local security forces to retain control should ISIS seek to reconstitute. In Iraq, where the military declared liberation from ISIS in December 2017, the terror group has already established sanctuaries, according to a report released on Thursday by the Institute for the Study of War, “setting the conditions for future offensive operations against the Government of Iraq.” And U.S. officials estimate there could be as many as 20,000 ISIS fighters in the region. There are still about 5,000 U.S. troops in Iraq. The commander of U.S. troops in the Middle East Gen. Joseph Votel warned March 7 against the “calculated” retreat of ISIS fighters from Baghouz, saying the exodus of thousands is not a surrender, but a decision to retreat to camps and remote areas in the region until they can reconstitute as a violent extremist organization once again. 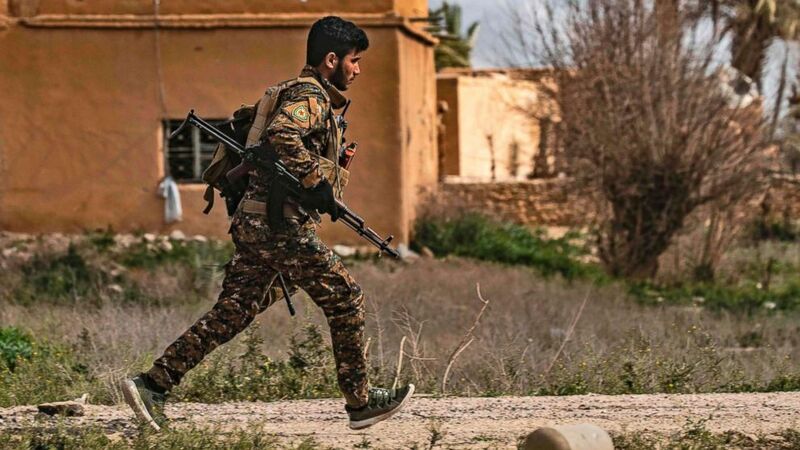 (Delil souleiman/AFP/Getty Images) A member of the Syrian Democratic Forces (SDF) runs for cover during shelling on the Islamic State group’s last holdout of Baghouz, in the eastern Syrian Deir Ezzor province, March 3, 2019. Kurdish-led forces backed by US warplanes rained artillery fire and air strikes on besieged and outgunned jihadists making a desperate last stand in a Syrian village. Votel told CNN last month that he opposed the U.S. withdrawal from Syria and testified before Congress that he was not consulted by Trump before the president announced the decision in late December. Another principal concern of Votel and the larger U.S. government is how the international community will deal with the thousands of ISIS foreign fighters now in SDF custody. The U.S. is pushing for them to be returned to their home countries, but that effort has, so far, been met with mixed success. Administration officials have said options for foreign fighters who cannot be repatriated include the U.S. detention facility at Guantanamo Bay, Cuba.